The McCoy Group has partnered with Frank Webb Home, the retail showrooms of F.W. Webb Company, to produce “No Place Like Home.” These one-minute video episodes aired as the lead-in to CBS Sunday Morning every week in March and will return to CBS affiliates throughout the Northeast in October with four new episodes. Designed to showcase the expertise found at F.W. Webb’s 40 showrooms, “No Place Like Home” is designed to inspire viewers with new ideas to update their homes. 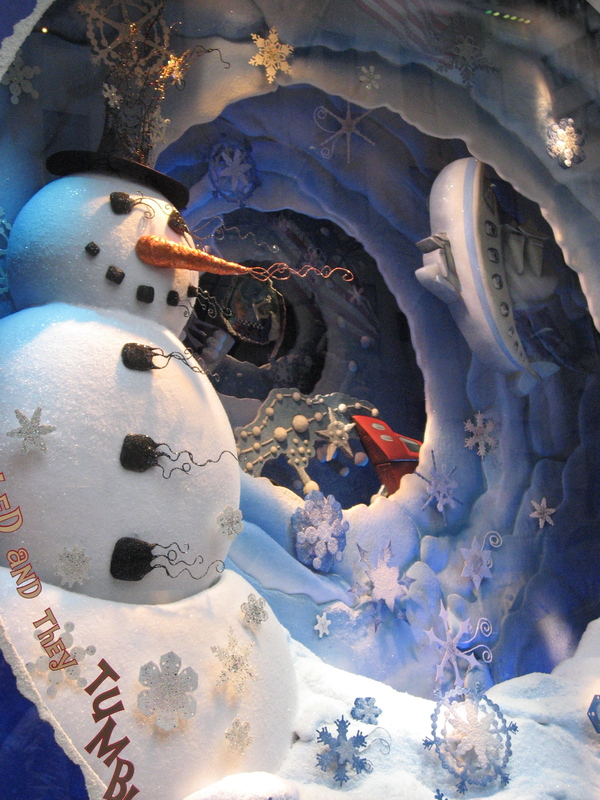 In addition to the television series, the “No Place Like Home” campaign is amplified through digital advertising, radio endorsements, direct mail and point-of-sale communications throughout the showroom footprint. To see the videos and learn more about the campaign, visit frankwebb.com/dream. Clarke, New England’s Official Sub-Zero and Wolf Showroom and Test Kitchen, has not only opened its first Boston location, but developed the newest design destination in the city’s hottest neighborhood. Right on 7 Tide Street in Boston Seaport, you’ll find 7 Tide, home to Clarke’s most extraordinary location yet plus the country’s first Experience Center for Marvin Windows & Doors. Check out this great video we did with CBS Boston all about this one-of-a-kind place. The client pays directly…net. All invoices should be sent directly to the client and The McCoy Group is not responsible for payment. The client has an impeccable payment history, when the invoices are submitted properly. If you send copies of invoices to The McCoy Group, we see them as just that: copies. We appreciate being kept in the loop and this allows us to communicate with the client on the details of the account, however, we will not be paying for media. We are the creative and media planning agency only. This has been an ongoing problem with media reps for the past two years. You will be given the client contact information for billing when we go to contract. Please make sure you pay attention to this. The next important point is this: F.W. Webb Company is the parent corporation and they will be paying the bills. However, the ADVERTISER is Frank Webb’s Bath Center (the showroom division of F.W. Webb.) Any time you refer to the client, please use “Frank Webb’s Bath Center.” It is essential for branding the showrooms that they be referred by the correct name. Who is Frank Webb’s Bath Center? Frank Webb’s Bath Centers are the retail consumer showrooms of F.W. Webb Company, the largest distributor of plumbing, heating, HVAC, refrigeration and industrial pipes, valves & fittings in the Northeast. The parent company deals with contractors, developers, engineers, facilities managers and more. Frank Webb’s Bath Centers assists homeowners/consumers with selecting plumbing fixtures, accessories and lighting for bathrooms and kitchens. Frank Webb’s Bath Centers are located in all six New England states, plus upstate New York and they will open their first showroom in Pennsylvania by the end of the year. There are more than 35 Frank Webb’s Bath Centers. 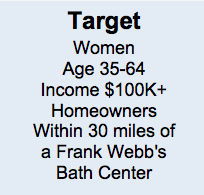 Frank Webb’s Bath Center’s primary target market is Women, age 35-64, income $100K and up. They also serve a secondary market of Men, age 35-64, income $100K and up. Customers generally live within 30 miles of a showroom. In some markets there is overlap between multiple showrooms, however several others are in stand-alone locations. We are not interested in media delivering multitudes of people; we are interested in media that delivers the specific target market. Feedback from Frank Webb’s Bath Center customers has confirmed the company’s differentiators: wide variety of quality products; friendly, knowledgeable showroom consultants passionate about helping homeowners create the project of their dreams; working displays that allow customers to see how various plumbing fixtures work (water pressure, water delivery, fixture operation, features in action); free delivery; willingness to work with your contractor to assure job success. The media over the past two years has been working, so we will not be changing much. We invest heavily in broadcast and cable television that efficiently deliver our target customer. We augment with radio in some, but not all, markets. We are launching a new website in Q1 2015 and will invest in a robust mix of online media opportunities. We will continue to use print extremely sparingly. If you can document the efficacy of your print media with our target market, please email information that defines your publication and why we should consider it. You must include a coverage map for your media so we can see how you deliver to more than one showroom. In your email, you must include your name, media outlet and location (if you are with a network of any kind, please don’t identify yourself as that network without the local market indicated) and all of your contact information. If you identify yourself as Bill from CBS and don’t tell us whether you are radio, television or online and what showrooms your outlet serves, it will be impossible for us to consider your proposal. In order to prevent wasting your time and ours, please do not send proposals for media that does not specifically target our customer. In some cases, you may think your medium is perfect, but the client has decided for various reasons not to consider certain media. These include: Pennysaver newspapers, Direct Mail Coupon Packs, Advertising Placemats, Shopping Cart Ads, among others. While some of these may have merit, we simply do not have the budget to include them in our buy and suggest you save your time by not contacting us. We will not be accepting cold calls and we will call any rep whose media information is of interest. If you do not hear back from us, feel free to send a second email, but please do not call. When a medium is being considered, the rep will get an email from us with the budget range he/she should plan to include in the proposal. We will always give you the NET budget. You need to indicate in your proposal whether the numbers you are using are gross or net so that we are on the same page. We realize that some of your computer programs only indicate gross, but if you don’t tell us that, we will think you disregarded our NET budget. When Will We Be Advertising? We are producing a new Frank Webb’s Bath Center :30 television commercial, which should be ready for airing by January 19, 2015. We would like to be on as many weeks as possible between Jan 19 – Jun 15, and again between Aug 20 – Nov. 1. Radio will be scheduled (depending on the market) between Feb and May and/or Aug-Oct.
Online will start between mid-January and mid-February and run through mid-November. We do not pay for media during the busy holiday season in November and December, so you need not send us gift guide or other holiday proposals. As we said at the beginning, we aren’t changing much, but we are always open to fresh ideas that make sense for the client. Thanks for your interest and we look forward to all information that makes sense. Happy Holidays! I have had many inquiries in the past month and reminders that I hadn’t updated this page in quite awhile. We are currently working with the marketing team at Frank Webb’s Bath Center to clarify the strategy and budget for 2015. When we have more information, I will update you here. There will not be any additional 4th quarter buys this year. All activity is now focused on 2015. Stay tuned for more information. Thanks! This allows me to search my long list of emails by FWBC and find all of your proposals easily and see that I’m looking at Part 1 of your 2014 information. If you don’t use this format for your subject line, you may get buried, which will cause you to not be considered. 2. Please attach a coverage map and indicate (in the body of your email) ALL Frank Webb’s Bath Center locations that would be covered by placement on your station(s), as the economies here are extremely important in our decision making. 3. Please do not call with questions; all communication at this point should be via email. 4. In your email, please send rankers that show your station vs. the market competition specifically for Women 35-64, HHI $100K and up. We would like these rankers to include news on your station(s), PLUS any programming that you believe would target this demographic in an effective way (and explain why you think this is the best way to get at this consumer). Please include your most recent book and rankers from Q1 of 2013. 5. Our secondary demographic is Men 35-64, homeowners with HHI $100K and up. Therefore, information on programming that hits our primary demo in a solid way and then also targets our secondary audience, will be of great interest. 6. Please DO NOT send specific schedules or proposals at this time, as we will have specific requirements once we have the budget/strategy finalized. This exercise is to see where you stand vs. competition with this demographic and understand the programming you offer that will specifically target our demo. We don’t anticipate budgets changing significantly from last year, so please do not showcase a line-up of all prime time, which will most likely not be able to be included in our budget. We are looking for news (which gets us our primary Women 35-64, plus our male secondary demo) and any other programming that targets these homeowners. 7. Please DO NOT contact the client, as they have requested that all 2014 proposal information come through us. 8. Remember, this buy is for Frank Webb’s Bath Center, the CONSUMER showrooms of F.W. Webb Company. The target audience is the homeowner (not contractors) here. 9. Please submit this PART 1 information via email no later than 5PM on October 21, 2013. P.S. We recommend all radio, online, print and other reps check back on this blog weekly to get updates. Thanks for your patience. We are in budgeting and strategy discussions with Webb about 2014. Please check back here during the first weeks of October to get complete information on how to submit your proposals.